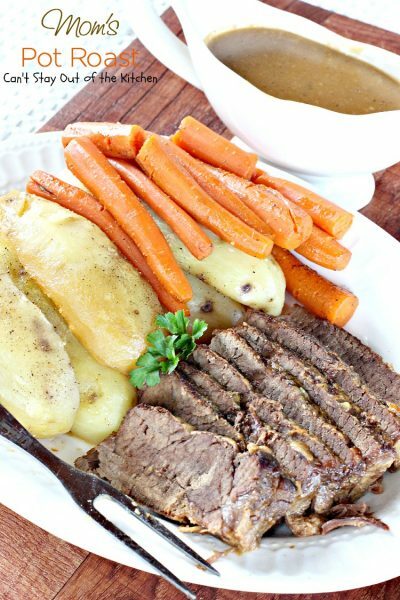 My Mom’s Pot Roast recipe is one of those comfort foods you just never get over or get enough of. 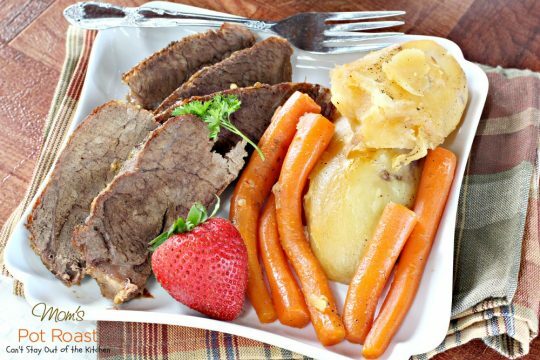 Growing up as a small child, I always looked forward to nights we had roast beef for dinner. Mom kept it very simple. Chuck roast, potatoes, carrots, salt and pepper and homemade gravy. Simple yet so sumptuous. Okay, by now I’m sure you’re exhausted from all my peach recipes. 🙂 Quite frankly, so am I! I love peaches and I’m still eating them regularly, but I think I’m done with any new recipes for the year (except one in salad I’ll post later this month). 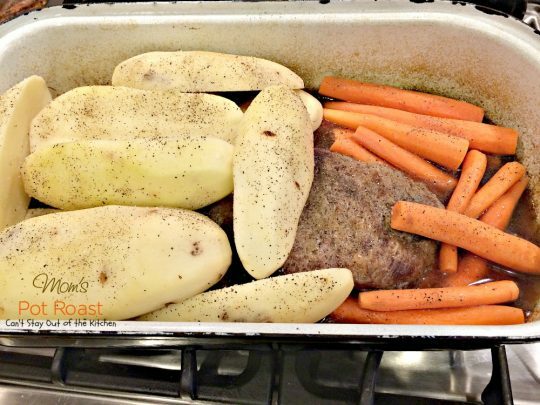 Mom would brown the roast and then cook it in her roaster with a little water for a couple of hours. She would peel and slice the potatoes and carrots and put them in salted ice water until time to add them to the roaster. Then she would add a lot of salt and pepper before baking the veggies and meat until done. 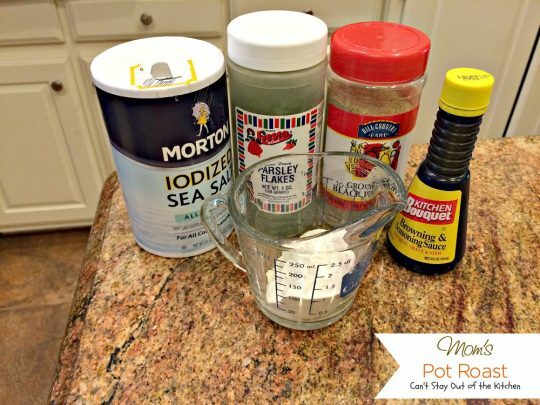 After removing the meat and veggies to a serving platter she would make gravy on top of her stove in the roaster with the pan drippings and water, a little Kitchen Bouquet and more salt and pepper. Oh it was so, so good. The savory flavors of beef and veggies smothered in gravy would just about do us in. Served with homemade bread that had been toasted in the oven and served with assorted jellies or preserves was heaven. 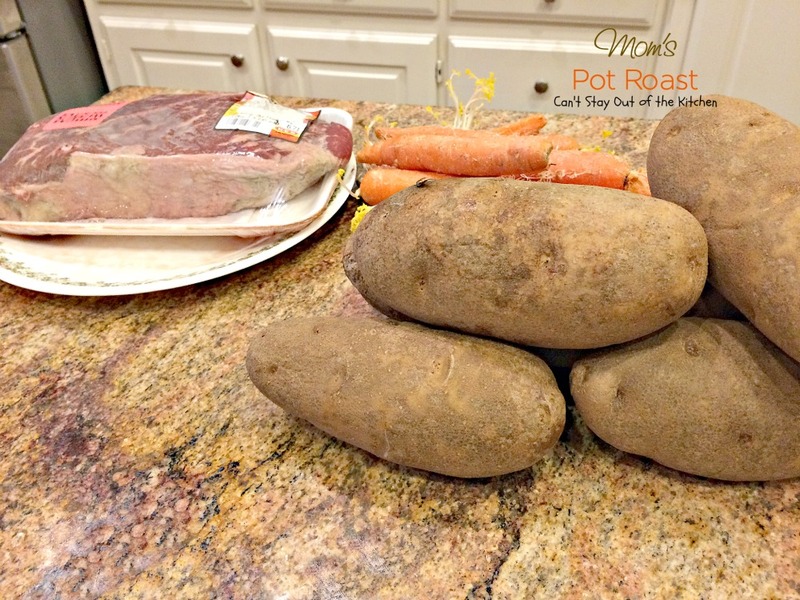 If you’re looking for a wonderful way to make pot roast, give my Mom’s recipe a try. Prepare to have your taste buds tantalized! Mom’s Pot Roast was always one of my favorite meals growing up. While this recipe does take a while to cook in your oven, there’s not a lot of work involved in preparation. 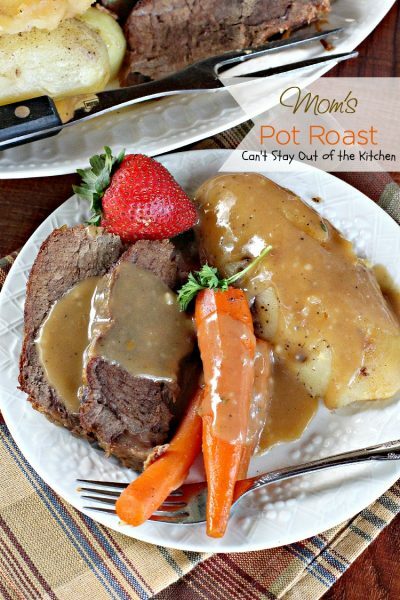 Mom’s Pot Roast makes a great company meal. I used these ingredients for the pot roast. I also used a little oil to brown the meat in the roaster pan. Generously salt and pepper your beef roast on both sides. Dredge beef in flour and and press in so beef is covered well. Reserve the excess flour in a small bowl to use later to thicken the gravy. Heat oil in a large roaster on top of stove. Add beef and fry on both sides until browned. Remove from heat and add about a cup or two of water. Sprinkle with salt and pepper. Cover with lid and bake in a 350 oven for 2 hours. 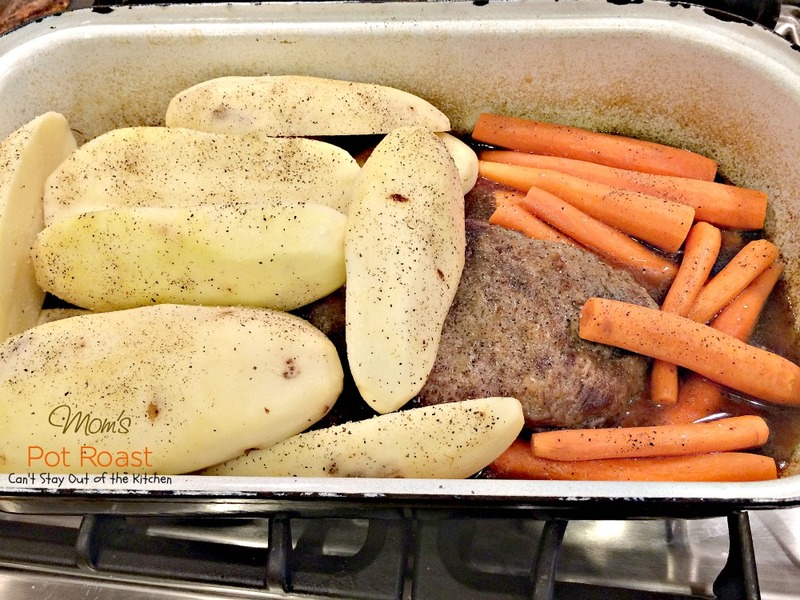 Add peeled carrots and potatoes that have been halved lengthwise. Sprinkle again with salt and pepper. Add additional water if necessary (another cup or so). Top with lid and bake about 1-1 1/2 hours more until carrots are fork tender. Remove veggies to serving plates and meat to a platter and slice down. Meanwhile, make gravy. I used these ingredients to make the gravy, plus garlic powder. The flour was the excess left over from dredging the beef. Place the roaster pan with all the drippings on top of the stove or pour into another saucepan. Bring to a boil. Add enough water to flour and whisk until a thin paste forms. Drizzle flour mixture slowly into beef drippings. Add parsley, garlic powder, Kitchen Bouquet, and additional salt and pepper to taste. 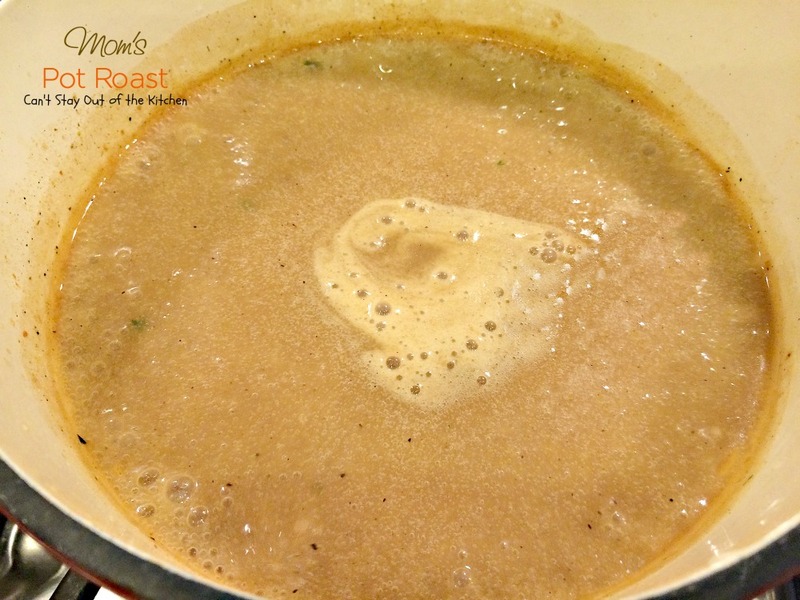 Boil until thick, whisking continuously. Pour into a gravy boat to serve. Serve meat, veggies and gravy on a platter. Mom’s Pot Roast can be served without gravy if you prefer. I prefer mine drenched in gravy – even the veggies! 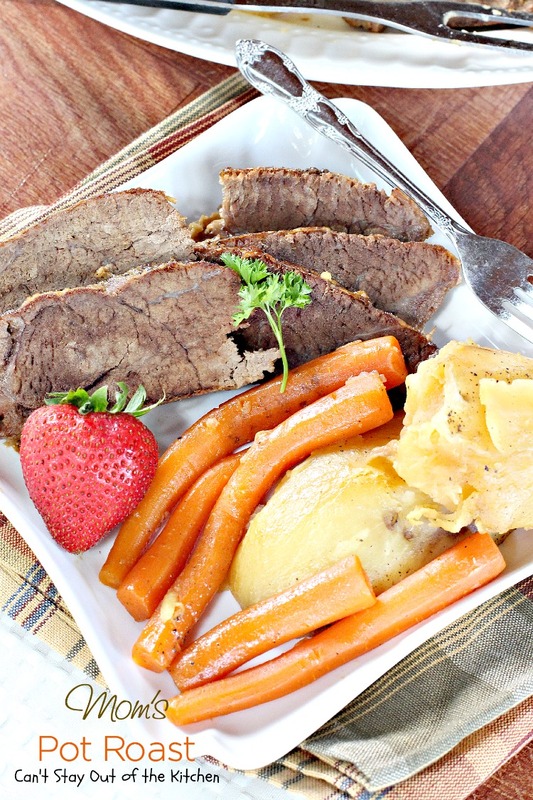 Sumptuous roast beef dinner is a family favorite and comfort food at it's best. 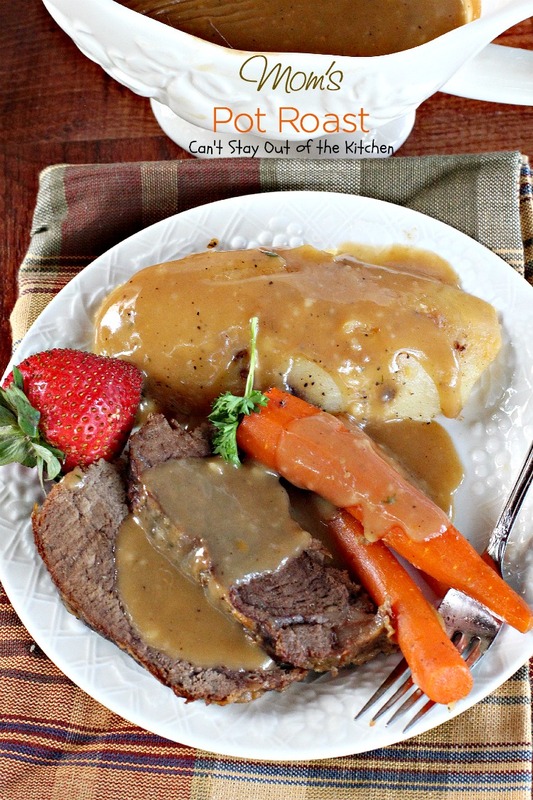 Served with potatoes and carrots, this one has a wonderful homemade gravy. 1 chuck roast – about 3 lbs. 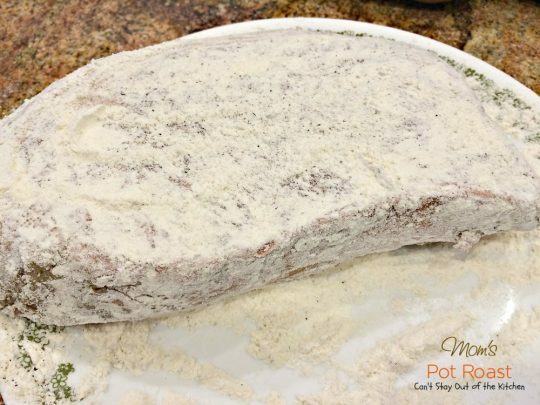 Sprinkle roast with salt and pepper and dredge in about half a cup of flour. 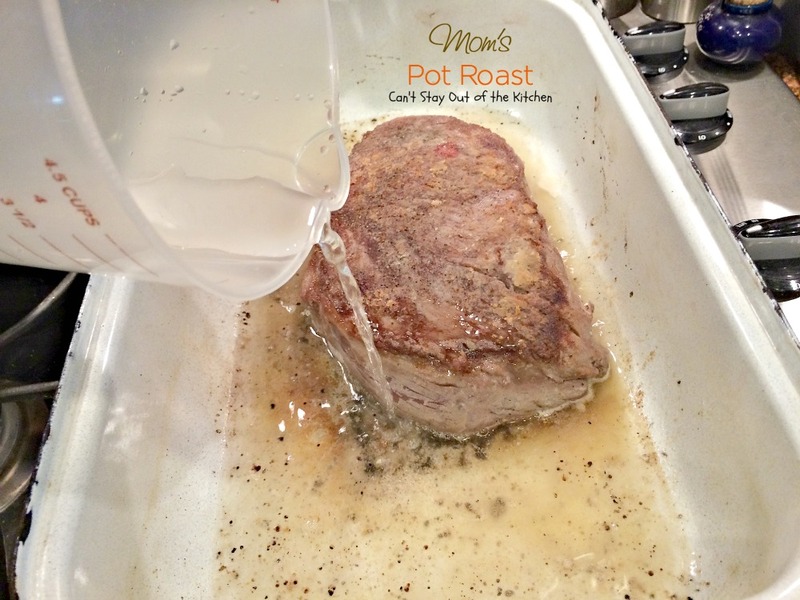 Heat oil in a large Dutch oven or roaster pan that can be placed in the oven. Brown meat on all sides. Add about a pint of water, cover roasting pan with lid and place in 350° oven. Put in potatoes, sliced in half lengthwise, carrots that are peeled and sliced lengthwise if very thick. Add another cup or pint of water if necessary. Cook in oven another hour to an hour and a half, or until carrots are cooked all the way through. Remove carrots and potatoes to a casserole dish. Remove meat to a platter and slice. Place roaster pan on stove top on medium high heat. Starting with about a half cup of flour, add cold water and whisk until mixture becomes runny. Whisk into broth mixture from meat. Season with garlic powder, pepper, parsley and a few drops of Kitchen Bouquet seasoning. If necessary, whisk another batch of flour paste into broth from meat in order to get a thickened gravy. Serve with meat and vegetables. NOTE: This can be prepared on top of stove just as easily and times will remain about the same. To bake in crockpot, you will need to put in everything except the stuff for the gravy. That will have to be added at the end just like original recipe. Bake the meat about 3-5 hours on low (with water and seasonings), then add the vegetables for an additional 2-3 hours until cooked through. Sumptuous roast beef dinner is a family favorite and comfort food at it’s best. 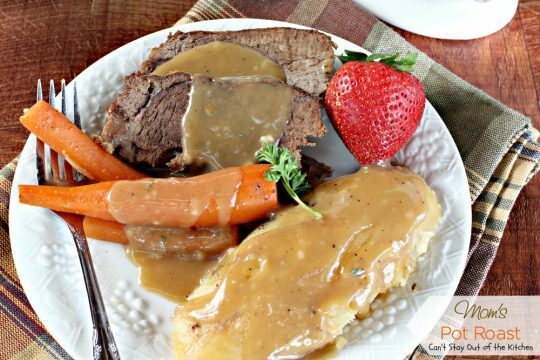 Served with potatoes and carrots, this one has a wonderful homemade gravy. 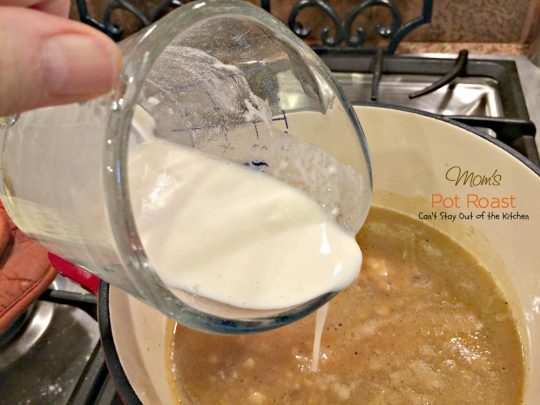 This can be prepared on top of stove just as easily and times will remain about the same. 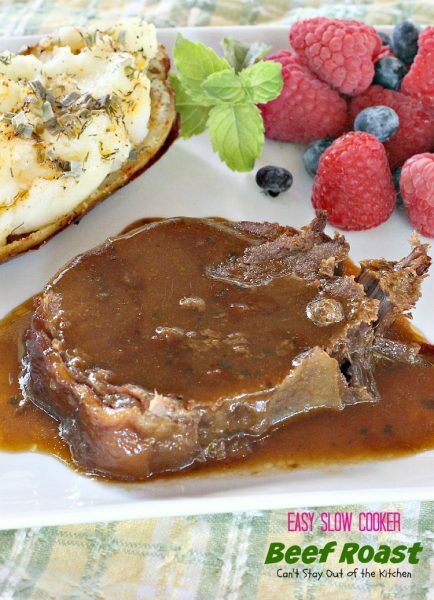 To bake in crockpot, you will need to put in everything except the stuff for the gravy. That will have to be added at the end just like original recipe. Bake the meat about 3-5 hours on low (with water and seasonings), then add the vegetables for an additional 2-3 hours until cooked through. Every bite of Mom’s Pot Roast is sumptuous and amazing. This looks and sounds incredible! I’ll use my large cast iron Dutch Oven, since it works very well on the stovetop to brown meat, as well as cooking it in the oven. I will however, add 2 medium onions (quartered) and a couple of garlic coves (minced) in Step #6. I plan to make this for our Sunday evening meal this coming weekend, and I’m sure that my family will love it! Thanks Teresa, for yet another delicious recipe! Your welcome, Angela. I sometimes use onions and garlic, too. But I’ve already posted those versions so I thought I’d stick with my Mom’s basic version. Hope you enjoy this. We just love it. This looks like the perfect comfort food, Teresa! 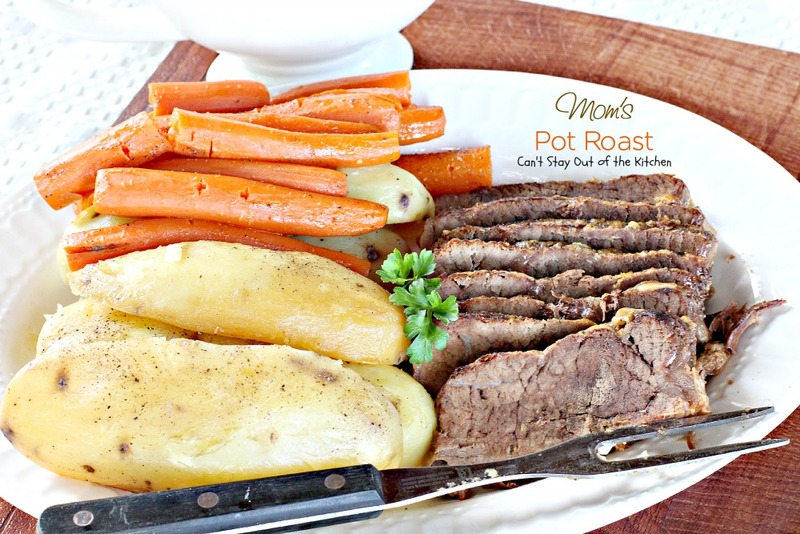 My husband (actually all of our family) just loves pot roast. I usually make it in the crock pot, but am glad to know how to make it in the oven. Your gravy looks wonderful, too. By the way, I just wanted to let you know I have changed to a self hosted website in case you weren’t notified. My address is cookazido.com now. Ok, I’ll check my bloglovin’ feed to make sure I’m still getting your stuff.